Explore stunning glaciers and waterfalls along the South Coast of Iceland. 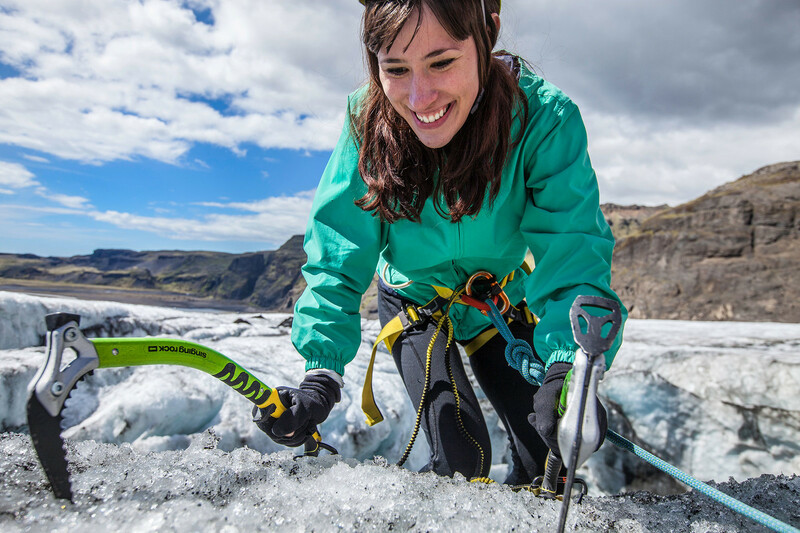 On this South Shore adventure heading to Sólheimajökull glacier, we combine our popular Glacier Walk tour with an easy introduction to ice climbing. As we explore the majestic landscapes of Sólheimajökull glacier, including water cauldrons, ridges, and deep crevasses, we search for a suitable spot to rig up our gear for a short introduction to ice climbing. After a short introduction, everyone will get a chance to have a go at a fun and easy ice climbing experience. After having fun on the glacier, we stop to marvel at two impressive waterfalls, Seljalandsfoss and Skógafoss. This tour perfectly combines the natural exploration of a glacier walk with the thrill of ice climbing in a fun and accessible way. Don’t forget your camera, you will want to share this experience with your friends and family. South Shore, Glacier Walk and Ice Climbing was my favorite day of my trip to Iceland. The climbing was challenging, but such a great experience. Once we got used to the crampons, the walking on the glacier was fun. The views were amazing. So glad we did this one. Adventurer of the Week: Amy Gets Hailed!